Perhaps this ought to have been called “Burning Bridges” instead of Broken Bridges. 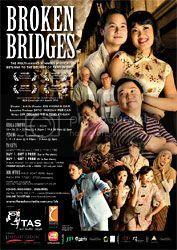 I thought the acting was generally good, with stand-out performances by Jon Chew and Ho Soon Yoon as Ming and Leong, as well as Sani Zainal Abidin and Tria Aziz as Tai Soh and Mak Ton. The songs were pleasant enough and worked well in the story, although I didn’t find any of them extremely memorable. Good marks for production design in general. There were some very funny lines, particularly in the first half – “Look at that girl! Her skirt’s so short you can almost see her… thigh.” (The story’s set somewhere in the mid- to late-Fifties, so it’s not stupid – just funny to modern audiences.) Not so much humour in the second half. The difference between the first and second acts is quite stark. The mood of the first is lighter, and the story is much more concise and focussed. The second gets more dramatic (really dramatic, at one point) and the story begins to wander and becomes a bit too complicated for its own good. Whilst the first act seemed very centered on Ming’s his desire to leave Ipoh and how it affected his father and best friend, the second seemed to dart quite suddenly to Ming’s modern attitude towards everything and how he eventually pays the price for his mistakes. His friend Leong, who was so important in the first act, suddenly seems to be invisible for most of the second act, which was bizarre. The second act was much more about Ming deceiving the townsfolk and betraying the trust of his lady love, which has only a rather tenuous connection to the first act. It’s this disconnect between Act I and Act II that makes me think the title ought to have been “Burning Bridges” instead. At the end of Act I, Ming chooses to burn his bridges behind him when he leaves, defying his father and ignoring the pleas of his friend. Then in Act II, he appears to set things right at first, but by the end of it, his mistakes have turned him into an outcast and yet again, he leaves town. The bridges weren’t broken, they were burned. First by choice, second by error – and he can’t go back and undo his mistakes. Ah, but I have to say that I enjoyed the audience reaction at this show. This was a rather more responsive crowd than I’m used to seeing a PenangPAC. The incredibly dramatic scene in Act II had audible gasps and exclamations of horror and disbelief (that they actually went as far as they did with it – I was pretty stunned too; kudos to Anrie Too for playing that difficult scene excellently), followed by dead silence in the subsequent scenes. I sound very nitpicky about story and such but regardless, I think Broken Bridges is worth a watch. It’s good to see the local theatre scene making progress.